Techmarket – Electronics, Organics, Shoes, Glasses, Tools, Fashion & Affiliates WooCommerce Theme is our answer to new trends in full resolution designs. Clean, smart, robust and flexible multi-demo & electronics store WordPress WooCommerce theme with vertical and horizontal menu variants – ideal for any type of eCommerce Shop. 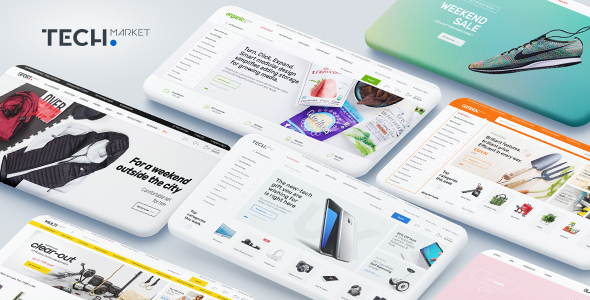 This theme is brought to you by the same team that developed Electro – Electronics Store WooCommerce Theme, MediaCenter – Electronics Store WooCommerce Theme, Pizzaro – Fast Food & Restaurant WooCommerce Theme and MyBag – Single Product WooCommerce Theme. Statistics says that much more potential customers are browsing websites in 1920px wide resolution now. In that way using old 1170 or even 980 grid system only, we are losing so much space we could use to show more products on for the user. Techmarket – Electronics, Organics, Shoes, Glasses, Tools, Fashion & Affiliates WooCommerce Theme, concept idea is to use as much space in very clean and user-friendly way to show lot of products in various ways. You can find 7 different shop demos, 8 different Home Page styles, 2 Landing Pages and lot of shop pages to choose your favourite. Any content from each single Homepage or shop page can be transferred into another one very easily. The design is well suited for Electronics Store, organics stores, retail stores, shoes store, garden tools store, glass store, vendor based marketplaces using plugins like Dokan, WC Vendors or WC Marketplace and affiliate websites using plugins like Prosociate or WooZone. It is built and comes bundled with most of the advanced features available in most popular eCommerce websites like amazon, flipkart, snapdeal, walmart, alibaba, aliexpress, souq, jadopado etc. So if you are an amazon affiliate or want a multi-vendor marketplace for your niche market or a store owner, this theme is for you. This is with placeholders and default WooCommerce products. If you are looking for dummy data similar to demo, please email our support and we’ll provide you with our dummy data. You can view the Techmarket Documentation here : http://transvelo.github.io/docs/Techmarket/.